Uplighting through the Summer in the Finger Lakes. It’s been an awesome Summer for Paradise Entertainment! It’s been great fun being part of the one of the most important days in a couple’s life! We’ve played at several old favorite venues and some awesome new places in the Finger Lakes and beyond. One of the new locations, was the Lincklaen House in Cazenovia, east of Syracuse. Thank you Jane and Kris Dourdas for making our job so easy. What a great, nice couple. One of the nicest we’ve ever worked with! Check out these photos! Another awesome Finger Lakes Wedding! Congratulations to Billy and Jesica Spears from Penn Yan! Their wedding their reception was at Sarrasins on Keuka Lake in Penn Yan (Thanks, Thom and Laura).11-11-11 only comes once every one hundred years and that’s why their wedding was the party of the century! What a blast! Their first dance was, fittingly, “Marry Me” by Train. Then things got out of control! The dance floor was packed all night, except when we took a break and played the shoe game! We learned that Jessica was the last person to buy something she didn’t really need and both Billy and Jess had wacky families. 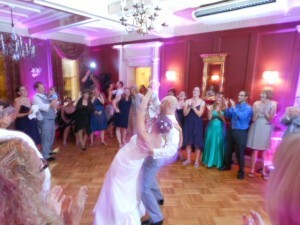 And thanks for letting Paradise Entertainment be part of your Finger Lakes Wedding. Congratulations to Ryan and Katrina Kachnycz! I usually can figure out the correct pronunciations on last names, but this one was tricky. BTW it’s pronounced Koch-niche. I haven’t been to the Ukranian Club in Auburn in some time,and I must say,they’ve really made some changes! 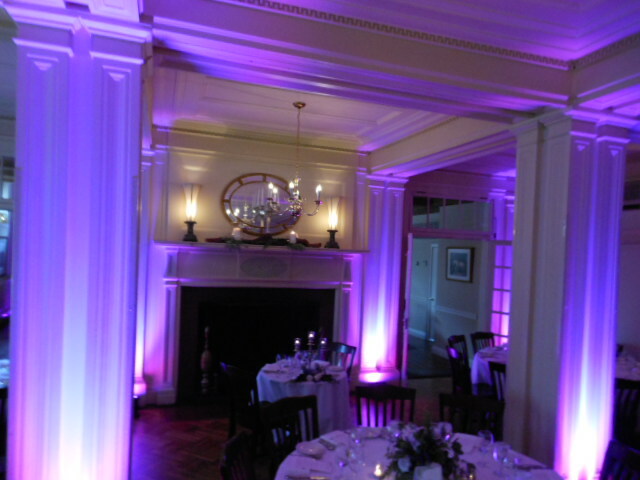 The room is a beautiful light blue and perfect for uplighting! The most memorable part of the night was Kristina’s dance with her mom. We always encourage mother daughter dances because mom really deserves her time in the spotlight. Kristina escorted her mother to the floor and danced to “Never Grow Up” by Taylor Swift. They also shared a dance to “Daughter” by Louden Wainwright III. If you get the chance,check both songs out on youtube. You may just want to use them at your Finger Lakes wedding. Ryan also danced with his mom to the contemporary classic “A Mother’s Song” by T. Carter. The dance floor was jumping all night with 90s club music,new country and some country favorites too. It was quite a mix of music. Thanks Kristina and Ryan for letting us be part of your incredible day! One of the most unusual bridal introductions we have done was at the wedding of Kevin and Laua Mackiewicz at the Corning Raddison July 23. Both the bride and groom were members of the Delaware University marching band and we played their music for the intros. The bridal party came in carrying all the things you would see at a halftime show at a football game including banners, large foam hands and signs. Then they circled around the room before returning to the dance floor. It was a riot! The room was lit with blue uplighting which really complimented the gorgeous banquet room at the Corning Raddison. 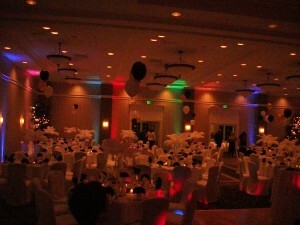 We also used Bliss Lights to give the illusion of dancing under the stars. 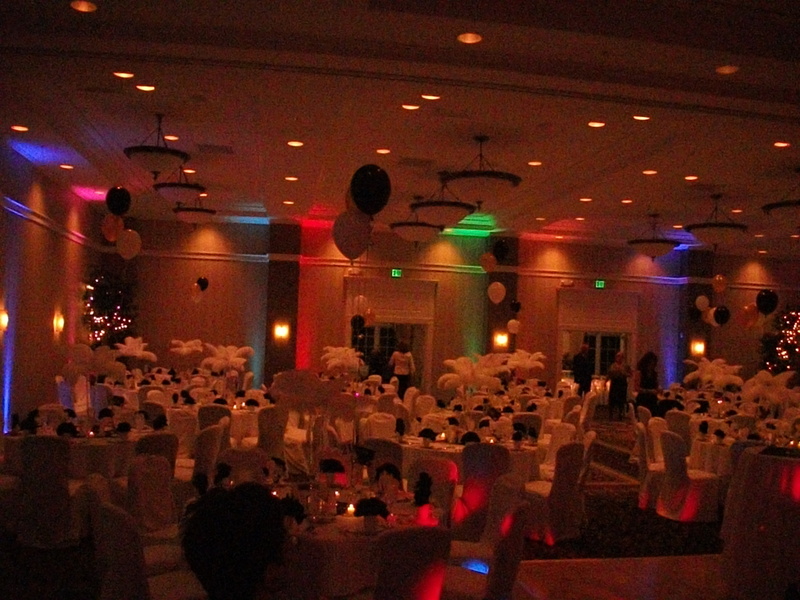 The dance floor was packed all night long and the wedding reception could have lasted another hour,but it was getting late. 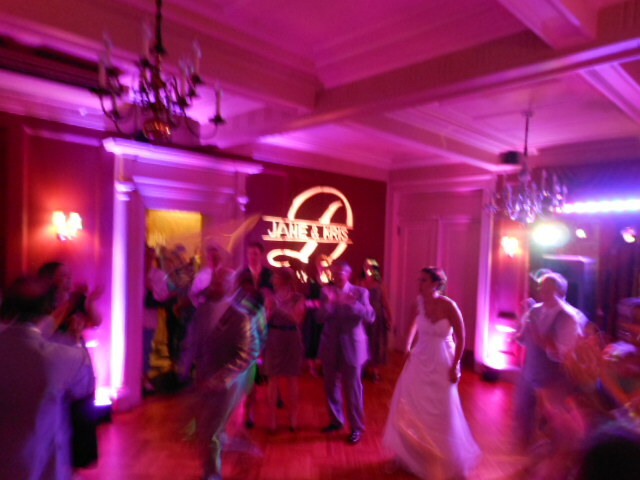 Thanks Kevin and Laura for making Paradise Entertainment part of your wedding! It was a nice change of pace to get out of the Finger Lakes for a night.